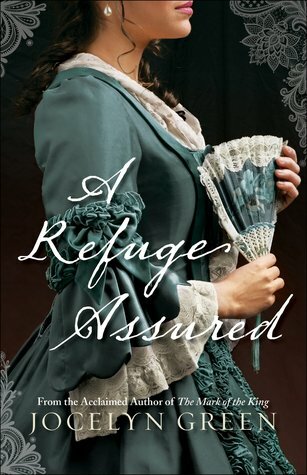 A Refuge Assured (2018) by Jocelyn Green is a stunning stand-alone novel. This novel comes in all forms including eBook, and is 400 pages in length. With a full-time job and a very busy five-year old, this novel took me a week to read. Do not be alarmed by my longer reading time with this book. This story is excellent. It was an incredibly busy week at work so I didn’t get a lot of reading time, and this novel is detail-rich. I had to stop often to do a bit of my own research to fully understand all that takes place historically in this story. I received a review copy in paperback form from the publishers, Bethany House. In no way has this influenced my review. The opinions expressed in this review are my own. I give this novel 5+++ STARS. This novel is a Christian Historical novel set during the French Revolution and the Whiskey Rebellion. There is so much depth to A Refuge Assured that one review will never be enough to cover every aspect of this book. It truly is a journey that must be experienced personally. In all honesty, I started to stress a little as my time to write this review was drawing near. I prayed God would give me the right words to honor this book and Jocelyn’s fantastic writing talent adequately. But, the closer I got to the time I would write this review, the more I started to stress. What can I possibly say about this exquisite story beyond, “Go get this book immediately”? And then the answer dropped into my lap on page 345! He has always tried to do the right thing, as he saw it. But it had been far too long since he’d asked God to show him the right, as He saw it. Oh my!!! For me, this message is the BEST part of this book. A truly excellent reminder to us all, but most especially to me. And, as all excellent messages do, it came exactly when I needed to hear it the most. I get so caught up in doing what I THINK is right that I often forget to do what GOD TELLS ME is right. Then I get all bunched up internally, I feel so overwhelmed, and I think to myself, “God, where are You, and why is nothing working out?” I get so stuck on me, I forget God even when I think I am doing things for God. Like Liam, I need to step back into the silence of night time and pray to God. I need to listen for His Voice and Direction, and follow the steps God has for me rather than follow the steps I think God has planned for me. It’s so subtle a thing, but truly the difference between doing what God wants versus what God doesn’t want. This book! It’s so good. As I sit here typing this review I can’t help but tear up. I’m running to God right now asking for His forgiveness for my very foolish, albeit innocent of guile, heart. I am praying He will set me back on His path, and forgive me for thinking my path was His intentions for me. That a book can do this to me, can have this level of catharsis, is truly an amazing testament to just how excellent this book is. Run to your nearest bookstore and purchase a copy of this excellent book. Yes, the characters are amazing. They are so well written it’s like I actually know them personally. The settings are so exquisitely illustrated, I feel like I have personally been to Paris, France and Philadelphia of the 1790s. The story line is so deep and well-researched that it is not possible to be bored by this book. And the romance, while not the main focus of the story, is definitely realistically and sweetly portrayed, so much so you will leave this book satisfied. I highly recommend A Refuge Assured for all these wonderful reasons, but I definitely recommend this book for the cathartic message. This book brought me closer to God in a way I never imagined, and I think all should have that amazing experience. Jocelyn Green, you have incomparable talent. I pray God blesses you with many, many more story lines to come. God bless you, and God bless this phenomenal story. I am giving away ONE (1) paperback copy of A Refuge Assured by Jocelyn Green. The giveaway begins today, 2-10-18 at 1:00 pm (PST) and ends on Wednesday, 2-14-18 at 12:00 pm (PST). To enter, click on the Rafflecopter link below. Good luck! I am eager to read A Refuge Assured? I’ve only read The Mark of the King, and it was so beautiful! I just finished The Lacemaker, and I can’t wait to ses how Laura and Jocelyn tied their two books together! The Mark of the King is a wonderful book. You will love A Refuge Assured for sure!